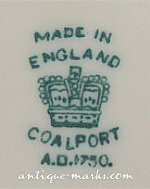 The Coalport porcelain manufactory was a market leading pottery throughout the 1800s, it produced a staggering range of porcelain products of all shapes and types. Seemingly Coalport was named Coalport because of the coal that was transferred from canal boats to river vessels in the Coalbrook Dale area. 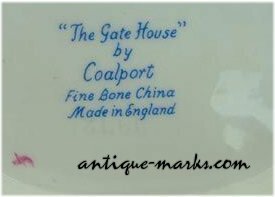 The Coalport pottery utilised a great variety of Coalport marks over its lengthy existence as well as early Coalbrook Dale marks and mock Sevres & Chelsea marks. Very early Coalport porcelain was unmarked, (c1805 and before) and in reality marks were rarely used before 1820. However, the porcelain collector should note that early CoalBrook Dale marks are extremely rare and very collectible. The early Coalport porcelain wares are mostly unmarked. Porcelain wares bearing a red painted ‘COALBROOKDALE’ mark in upper case are extremely rare and highly collectible. 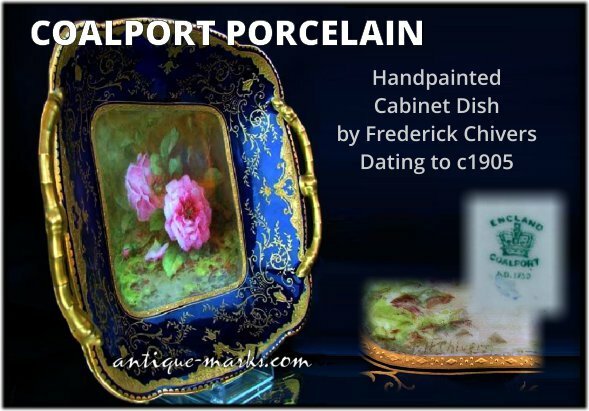 c1810 to 1825, rare examples of Coalport porcelain is marked in underglaze blue, ‘Coalbrookdale’, ‘CD’ or ‘C. Dale’ after the local town. Some bear a crossed swords mark. Most are found on colourful floral encrusted porcelain wares. 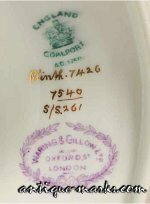 c1815 to 1825, some Coalport plates and dishes include impressed numerals. Plates usually bear an impressed number ‘2’. The impressed number ‘1’ and ‘6’ are rare. 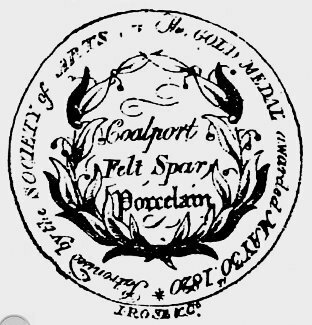 From June 1820 to c1830, a series of prominent printed ‘Society of Arts’ marks were placed on Coalport porcelain wares. 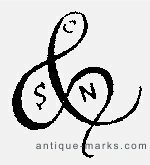 Items bearing the ‘Improved’ mark from c1825. Cabinet Plates with the ‘Society of Arts’ mark and the impressed ‘2’ from c1825. 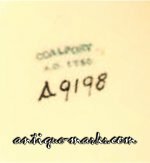 c1830 to 1850, Coalport used many written and printed marks. all of these include the title ‘ JOHN ROSE & Co. ‘ and also often feature the address. This can be simply printed or within a design. 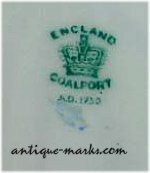 c1850 to 1870, Several Coalport printed marks include the initials; ‘J. R. & Co. ‘ or ‘J R & Co‘. They may also include the words ‘ English Porcelain ‘. c1845 to 1855, Coalport produced many Sevres & Chelsea porcelain imitations that can often include copies of the original Sevres or Chelsea marks. The mock Chelsea mark can be an overlarge gold anchor. Ornate and fine quality Coalport porcelain can include mock Sevres marks with a C at top. c1851 to 1861, Ornate porcelain wares can feature a gold painted mark of interlinked CBD. 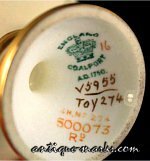 c1861 to 1875, Some Coalport marks feature a painted or gilt ampersand. 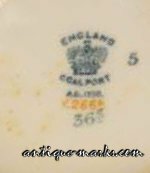 c1870 to 1880, Coalport Salopian printed mark featuring ‘ C AD 1750 & AD 1790 ‘ within a roundel in brown on tablewares. 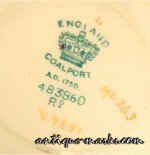 c1881 to 1939, Coalport introduced a standard Crown mark. 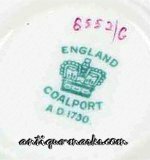 From c1881 all Coalport porcelain wares include a version of this Coalport Crown mark. Or as complex as a mock Sevres porcelain variation which includes the words; Sevres above COALPORT above the Crown mark, which has BONE CHINA beside it and MADE IN ENGLAND, above AD 1750 and the word Embossed below. 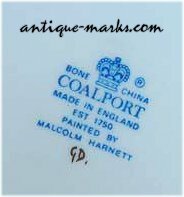 Coalport marks can also include retailers marks as per the Waring & Gillow mark in the gallery below.